Gather around the round table, choose your sword, and battle to victory! 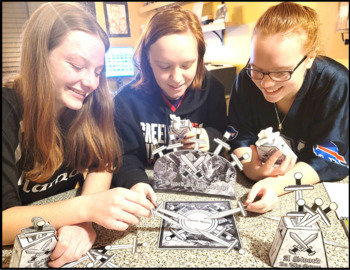 This game will bring back traditional fun as you use both strategy and luck to win! This game is war with a twist. Each sword has unique features which allows each player to combat in different ways. Do you have what it takes to wins all the swords? Can you pick a sword in the stone to help you along the way? Battle to the end and use your wit. This game will keep you coming back for more. 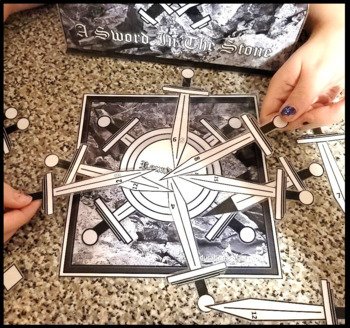 This game contains an assortment of pieces which includes 48 swords, a round table battle platform, instruction booklet, directions card, and interactive stone. The game is played by using the different types of swords to capture other swords. The goal of the game is to capture all player’s swords. Some swords have unique properties that can either give a player an advantage or set them back. This game is all about strategy and how it increases your luck to capture more and more swords. All you have to do is cut, laminate, and tape to assemble. 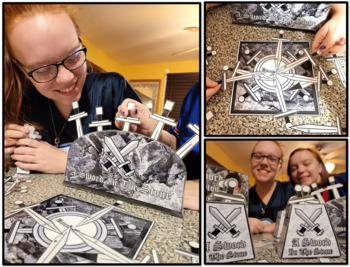 Depending on the quality and prep time you put into this game, there is even a customized box in this package which will look great on a shelf. 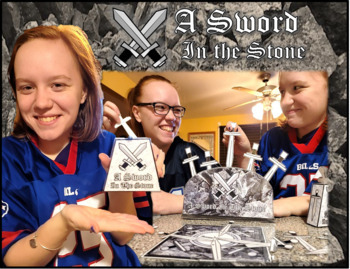 Whether if its playing during your downtime in the classroom or adding a new board game to your collection, A Sword in the Stone will be your newest classic. Bring the family back together. Get started today.